Yolanda was born and raised in Little Rock, South Carolina but has spent most of her adult life in North Carolina. 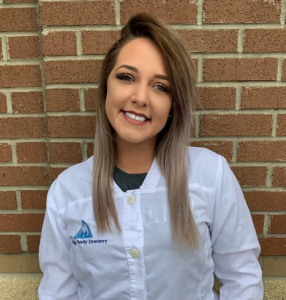 She became interested in dental hygiene and had the opportunity to volunteer at the Health Department in Cumberland County. While volunteering she was able to assist with various dental projects in the community as well as gain a deep commitment to the dental hygiene profession. She obtained her degree in dental hygiene from Fayetteville Technical Community College where she was SADHA president as well as student ambassador in 2003. After graduating, she served as NCDHA president for Cumberland County in 2004. Yolanda and her family moved to Fuquay Varina when her husband retired from the military in 2003. She loves to travel to see friends and family. Samantha is a native to Fuquay Varina. In 2009 she graduated from Central Carolina Community College (CCCC) as the first graduating class of the program. She lives in Fuquay with her husband and two year old daughter. She still serves as a board member at CCCC and in her spare time enjoys being with family. Tang was born and raised in Los Angeles, CA and moved to Fuquay-Varina in 2018 where he resides with his wife. Tang earned his B.S. in Biochemistry from the University of California, Los Angeles in 2013.In 2017, he graduated from West Los Angeles College’s Dental Hygiene program where he provided education and dental hygiene services for veterans and those in underserved communities. Tang is passionate about education, preventative care, and helping his guests achieve optimal oral health. When Tang is away from the office, he enjoys spending time with his wife and friends—playing tabletop games and practicing martial arts.